alaTest has collected and analyzed 46 reviews of Philips Fidelio NC1. The average rating for this product is 4.0/5, compared to an average rating of 4.2/5 for other Headphones for all reviews. Reviewers are impressed by the price and noise isolation. The portability and comfort also get good comments. We analyzed user and expert ratings, product age and more factors. Compared to other Headphones the Philips Fidelio NC1 is awarded an overall alaScore™ of 89/100 = Very good quality. Fairly pricey; while the headphones offer a lot of detail, the sound is on the bright side, which may lead to some listening fatigue. While the Philips Fidelio NC1's sound may be a little too forward for some listeners, it does have an excellent design and decent noise-canceling. Comfortable "on-ear" design. ; Great audio reproduction. Lacking volume controls. ; Slim, potentially fragile build quality. ; Treble delivery varies significantly across users. Sensitive to positioning. For all the reasons above, if I had to choose between the Bose QC25s and the Philips NC1s, I'd go for the NC1s – they sound slightly better, they pack slightly thinner and they wear slightly lighter. 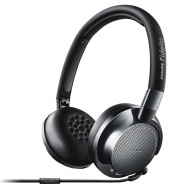 The Philips Fidelio NC1 are noise-cancelling headphones that are part of Philips's premium headphone range. They're for people willing to pay a bit more for great sound, but who also want some style. These comfortable headphones are great for noisy commutes, although the sound lacks a little bite. There's a lot to look for in a pair of noise-cancelling headphones - can the Philips NC1s deliver? One of the most comfortable pair of on-ear cans we've used that both look and sound great. The Philips Fidelio NC1 headphones offer up supreme comfort for those who regularly travel long distances. The Philips Fidelio NC1 easily hold their own against other brands in the crowded noise cancellation headphone market. These headphones stand out because of the sleek design, excellent sound quality and value price.